Pong is a computer game which is comparable to tennis. It's supposed to be the first computer game and was created by Atari in 1972 (Pong Arcade). Two players are using a bat to punch a moving ball to the opponent's field. If a player is missing the ball, the other one is scoring one point. The game is over if one players scores up to nine points. The bats are symbolized by rectangles which can be moved up and down on the screen. The ball is bouncing from the bats or from the upper and lower screen border. If the ball hits the left or right border, the player of the opposite site scores. The score is visualized in the upper screen centre. The graphical output, with the screen resolution of 640 pixel times 480 pixels, is done via the VGA port of the Nexys2 board. Different colours are used to improve the game experience. Score and bat have different colours for each player (Player 1: red, player 2: blue). The ball and the middle line are displayed in white. The positions of the bat, the ball and further objects are defined trough their origin. The origin point is placed in the upper left corner of each object. This point is the reference for the game physics and the display on the screen. All objects are defined by their origin point and their height and width. A bat for example has the dimensions 15x70 pixels and the ball 15x15 pixels. Only the origin might change during the game. The score board and the middle line have fixed origin points on the screen. The horizontal axis is called the x-axis and the vertical axis the y axis. The origin of both axis is placed in the upper left corner of the screen. The values on the axis are increased due moving along in rightward or downward direction. The bats can be moved vertically. Each player can move his bat parallel to the y-axis due pressing the corresponding button. The maximal movement speed is set by the game. The bats can't be moved outside the visual area. The ball is moved in x and y direction by vector addition. The ball is moved on a random vector (28 different vectors are possible). Direction, angel and speed are set by the game. The position of the ball is manipulated after a variable time period. 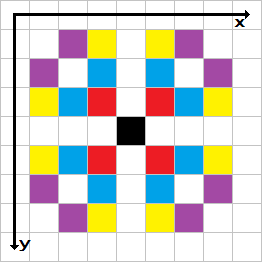 The vector of the movement consists of a x and a y component (values form -3 up to 3). If the ball hits the upper or lower screen border, the y component of the moving vector is negated. The ball seems to bounce from the wall. If the ball hits one of the bats (Y position is in the range of the bat's height, x position is the range of the bat's width), the x component is changed and the movement speed of the ball is increased (refresh time of the ball position is lowered). It might happen that the ball is missed by a player. If the ball hits the left or right border, the opposite player scores, the ball position is reset to the middle of the screen, the movement speed is set to default and a new moving vector is created. The game is over if one player scores up to 10 points. The game is resetted afterwards. VGA port uses basically five wires. Three of them are used to describe the colour (red, green, blue / RGB) and two wires are used to synchronize the electron beam in the monitor (Horizontal synchronization and vertical synchronisation / H-Synch, V-Synch). The electron beam is moving line by line from upper left to lower right and is displaying the pixels on the screen. The colour is changed in parallel to the movement. The current pixel's colour can be changed due simultaneously altering the colour signals. The colours are limited to 8bit on the Nexys2 board. There are three bits for red, three bits for green and two bits for blue. H-Synch is used for the end of the line and V-Synch for the end of the whole frame. The timing tables from the manual can be used to synchronize the clock signals for the different timing signals. The Nexys2 reference manual holds an example of a VGA driver as well. I decided to use an open source VGA driver. This component was written by some student of „Department of Electrical and Computer Engineering“ from of university of Alberta (Source: [http://www.ece.ualberta.ca/~elliott/ee552/studentAppNotes/1998_w/Altera_UP1_Board_Map/vga.html ualberta.ca]). The VGA driver holds four inputs, five outputs (VGA signals: R, G, B, H-Synch, V-Synch) and two vectors as outputs. It's powered by a clock signal of 25MHz. The timing table is integrated into this component and is used to generate the timed signals H-Synch and V-Synch. The VGA driver is counting column and row (x/y position) of the current pixel and is outputting this position via the output vectors. The colour inputs are directly connected to the colour outputs. An external logic is needed to set the right colour to the right time. -- The signals Rout, Gout, Bout, H and V are output to the monitor. -- using logic to create single red, green, and blue signals. The VGA driver needs a clock signal of 25MHz, which is realized with a 2:1 divider - the board clock with 50MHz is used. This module expects a 25MHz clock signal and the control buttons as inputs and outputs the VGA signals. The component vgatest consists of function blocks, which are used for the graphical output, the game physics and the VGA port control. The VGA port control is done by the VGA driver, which structure is descript in this component. Graphics and game physics are controlled by parallel processes. This process is responsible for the correct colour signals for the current pixel. The origins and dimensions of all objects are considered. The position of the moving objects is described by variables (Internal signal in the architecture of the module) which can be altered during the game. This process is responsible for the movement of objects, for the score board and for processing the user's input. The moving vector for the ball is generated by a separate procedure. -- einstellbar. Randpositionen werden berücksichtigt.